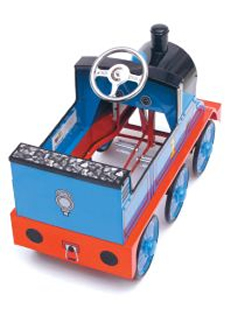 Wow this is the ORIGINAL Thomas the Tank Engine pedal train, made under licence. Delivered direct to your door fully assembled so that the driving experience can begin straight away. Magnificently made to provide hours of fun and games for you child. This is an heirloom gift that will last for generations. 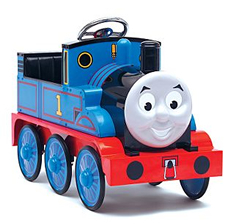 Our Thomas pedal train is a brand new, full sized, UK designed pedal train that will last longer and grow with your child. A true representation of Thomas the Tank Engine, it is made from a steel chassis and rust free aluminium body, finished with a fade resistant powder coat painted for a durable finish and long life. Guaranteed to keep your little ones busy for hours, showing this off to all their friends. The new train promises to be a great favourite with young and old. We can see these not only in your garden but at playgroups, children’s nurseries and children’s activity park’s, in fact anywhere there are children these are a must. The seats and backs are padded for that extra comfort. There are decorative dials in front of the steering wheel and an imitation coal design at the back to add to the fun. Ages 2 to 6 year approx. inc vat & UK mainland Delivery..